Macon, GA, May 16, 2017	(Newswire.com) - Founded by two educational professionals who retired in June 2012, the mission of the Academy for Classical Education (ACE) is to build the foundation of knowledge and critical thinking skills necessary for children to become independent learners for life. Laura Perkins and Esterine Stokes have been amazed at the number of students, teachers, parents, and community members who value education and want a place that ensures the integrity of the teaching/learning environment. Within months of retirement, they started ACE to provide a structured educational experience as well as develop students to be better citizens, better consumers, and more involved in the community and the world we live. Communicating this valuable mission and purpose locally was very important to them. 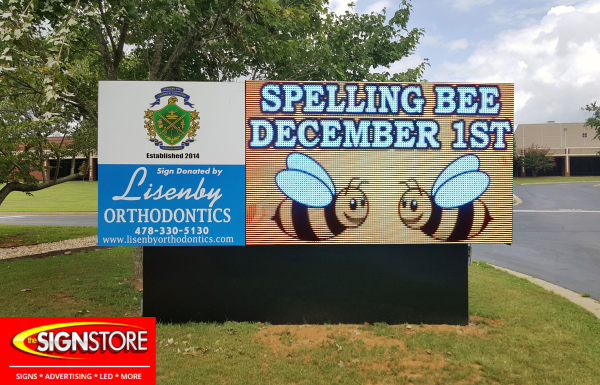 They worked with a local sign company, The Sign Store, and Lisenby Orthodontics to secure a new sign featuring a cloud-based full-color LED message display. Jim Waite, Athletic Director at ACE, stated, "We have had so many compliments from parents and visitors to our campus, and the graphics on the board are superb. We could not be more pleased with the sign and the technical support we have received from The Sign Store." The Sign Store was founded in Macon, Georgia in 1998. What started as a simple sign shop has now grown to become a dominant leader in LED message center sales and services in middle Georgia.